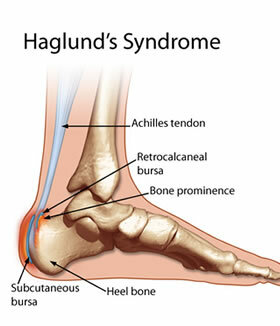 Haglund's Syndrome is when Achilles tendonitis and retrocalcaneal or superficial calcaneal bursitis occur together in the same foot. Haglund's deformity is a bony enlargement on the back of the heel. The soft tissue around the Achilles tendon becomes sensitive and painful when the bony enlargement rubs against shoes. This results in painful bursitis, which is an inflammation of the bursa (a fluid filled sac between the tendon and bone). The major cause of Haglund's deformity is rubbing and pressure on the back of the heel from shoes with a rigid heel counter. People can inherit a foot type or structure that gives them a natural tendency to develop Haglund's deformity. High arches, a tight Achilles tendon and walking on the outside of the foot are the main foot types and problems that contribute to Haglund's deformity. Orthoses to improve the function and alignment of the foot. The orthotics prescribed and designed by the podiatrists at the Heel and Arch pain Clinic (affiliated with Beyond Podiatry) are made to align the foot in the correct posture.